The Bear Archery BR33 Hybrid has already conquered the hearts of many hunters, for the simple reason that it is a really fast compound bow, reaching speeds of 330 fps, with an 80% let-off that eliminates the risk of dry fire when you have to hold the bow at full draw. There are many benefits this bow offers, as you will see right away from our in-depth review. The pricing is also convenient, seeing how it is sold with a wide array of Trophy Ridge accessories that make it ready to shoot. It is essential that the compound bow you pick from the many available comes with a durable, yet lightweight build. A few elements from the configuration of this particular model will convince you that the Bear Archery BR33 Hybrid is the one for you. The limb pocket system, for instance, is made from aluminum so that it will influence the total weight of the bow positively. The Max Preload quad limbs balance the bow, making it ideal for any scenario since the configuration doesn’t take from the possibility of shooting straight each time. The aluminum construction, as a whole, is aimed at delivering durability without the usual cost of adding weight by using heavy materials. You will be pleased with how robust this compound bow feels. Seeing the reputation of the company making it, you can rest assured that you will receive a good quality product. Regarding design, the engineers at Bear Archery were focused on combining and delivering the best of both worlds, by getting together the single cam systems’ smooth draw cycles, and the superior power of hybrid systems. And, due to the EAZ hybrid cam system they put in place, that goal was reached. Capable of reaching 330 fps, the model comes with modified tracks, and with this hybrid system for the cams, it ensures that you will have both accuracy and power by your side. The draw length varies between 27 inches and 32 inches, which means that the compound bow caters to many shooters, and there are also configurations available in the 45-60 pounds, and 55-70 pounds, for draw weight. The Versa grip is another element of design that increases accuracy and comfort. The bow weighs 4.2 pounds, which is quite ideal for most male hunters, while the 7-inch brace height ensures that you will experience the forgiveness offered in the best conditions possible. 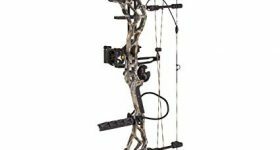 Overall, this is an excellent looking compound bow that comes with a stable configuration and innovative technologies in place. It is important to mention that this model comes ready to shoot, which means that it has plenty of extra accessories that will convince you that this is the bow you want. All the accessories are from the Trophy Ridge line so that you can expect good quality. A sight is provided to help you identify your prey more efficiently, while the whisker biscuit arrow rest adds comfort to the entire configuration. You will also get a stabilizer that will allow you to keep your shots consistent and increase your performance out in the field. A peep sight completes the picture, along with a nock loop. As you can see, all these extras are thought to provide you with the much needed extra edge for ensuring that each hunting trip is a success. There are a few features included that offer noise suppression of superior quality in this bow. First of all, it comes equipped with the Sonic Stop system which is a signature feature for the manufacturer. It stops the natural vibration that occurs when releasing your arrows and does not give away your location, especially when you are hunting down prey known for its sensitive sense of hearing. 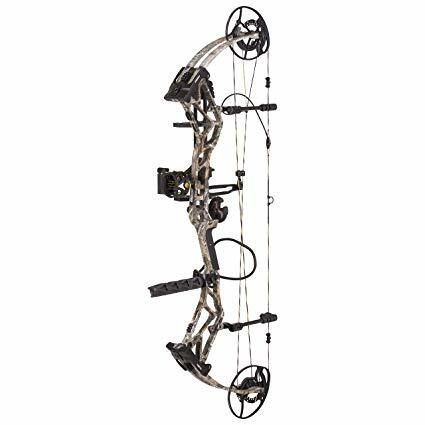 Another design element that contributes to the silent and deadly performance of this compound bow is the way the limbs are thought in the overall construction. The Max-Preload quad limbs ensure that their parallel position will eliminate some of the noise and vibration when you shoot. It serves to have such a smooth shooter when you stalk game in the woods and want to remain hidden from view. There are plenty of great things to say about this model from Bear Archery, starting with its whipcord fast speed that puts it above many other compound bows available on the market. As many hunters know, speed is paramount to have arrows penetrate the thick hide of most game, so making sure that your arrows don’t only reach the target, but can also take it down, is an essential feature for a high-quality bow. The Bear Archery BR33 Hybrid delivers, and, with the help of the cam system, it ensures a smooth draw cycle that makes it an absolute pleasure to use. Many hunters are already pleased with the bow, as well as the many Trophy Ridge accessories, well known for their overall excellent quality and performance.